The Cross-Media Forum Conference 2012 explores how media organisations and formats are engaging with audiences across multiple platforms. The third session focussed on a series of case studies from BoomGen Studios, the National Film Board of Canada, Potemkino and Egmont Press. First up was Mahyad Tousi, co-founder and CEO of BoomGen Studios, “an innovative storytelling factory and next-gen global entertainment company focused on stories rooted in west/central/south Asia”. Tousi moved out of a career in film production in order to convince private financiers to invest in original projects. By liberating narratives from one format to create “sustainable storytelling” Tousi believes you not only broaden engagement and reach the largest audience possible, but also increase revenue potential. 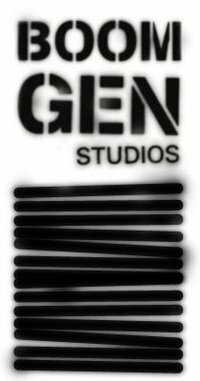 Tousi’s case study was BoomGen Studios Operation Ajax, “the first true-to-life spy thriller in a new genre of interactive transmedia story experiences”. After an entertainment app, BoomGen are now extending the project’s lifecycle by creating other products including games, an animated feature, and an academic edition to tap into the digital education content market. Next was Loc Dao who leads digital content and strategy for English Programming at the National Film Board of Canada under the mission statement “the creative application of technology to story and form”. Explore their interactive projects here. Dao also introduced a forthcoming project ‘Black Box’ with Lance Weiler, Film 4.0 and Channel4. Peter De Maegd, founder of Potemkino, introduced transmedia project The Spiral, discussing the challenges of building an interactive story architecture and “participation pyramid” with mass media at the base (i.e. 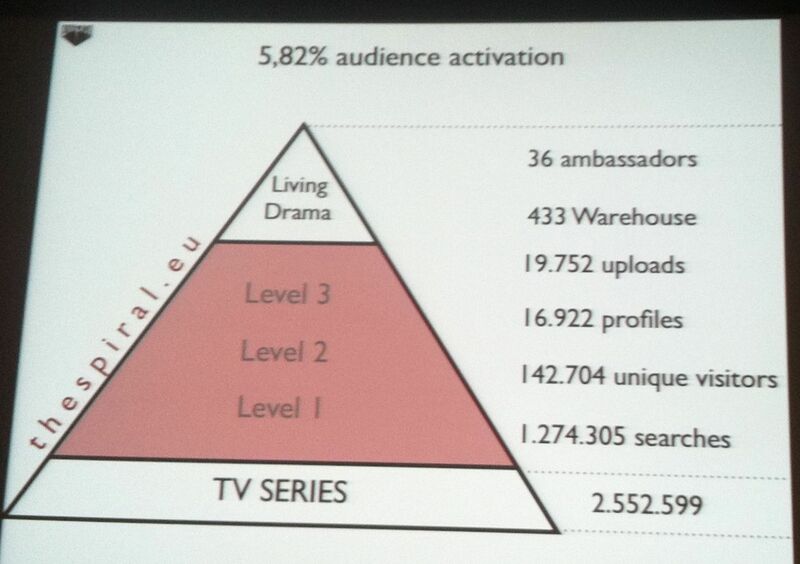 the TV series) and participatory media at the top (i.e. the “living drama”), reacting to the fact that the majority of audiences still want a ‘lean-back’ experience. De Maegd discussed the vast array of narrative experiences undertaken during the project – including “in story” and “out of story” content production, activity in the social spaces, and live events. When discussing outcomes (shown) he reports audience activation from TV to social at only 5.82% (rising to 14% via broadcast partner Arte). Last up in this session was Cally Poplak, MD of children’s publisher Egmont Press, discussing the opportunities in digital publishing for “writing, reading, play, content extension beyond story, and revenue”. Poplak stressed that digital product extensions are only valuable if they enhance the story and reach a broader audience than the print market. 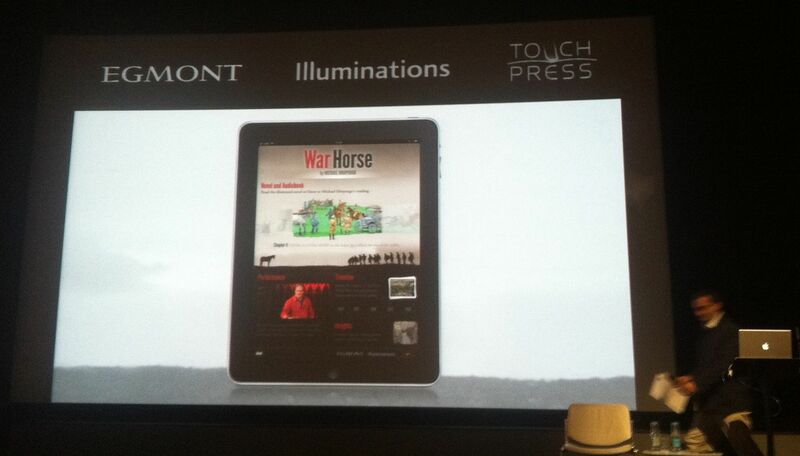 She discussed Egmont’s War Horse property, boosted by the theatre and film adaptations, but extended in the market through forthcoming digital propositions. The app will launch in November 2012 and includes the publication itself, a synced audio-book, a historical timeline with various documentary materials, TouchPress‘s signature 360-degree images, and specially commissioned films. Previous: Previous post: Cross-Media Forum – Part 2: Paul Tyler and Wayne Fletcher on how to engage transmedia audiences.